San Francisco, CA – San Francisco Community Health Center in collaboration with UCSF Center of Excellence for Transgender Health kicks off National Transgender HIV Testing Day on April, 18th 2018 by holding a daylong event to engage the transgender community in their healthcare. 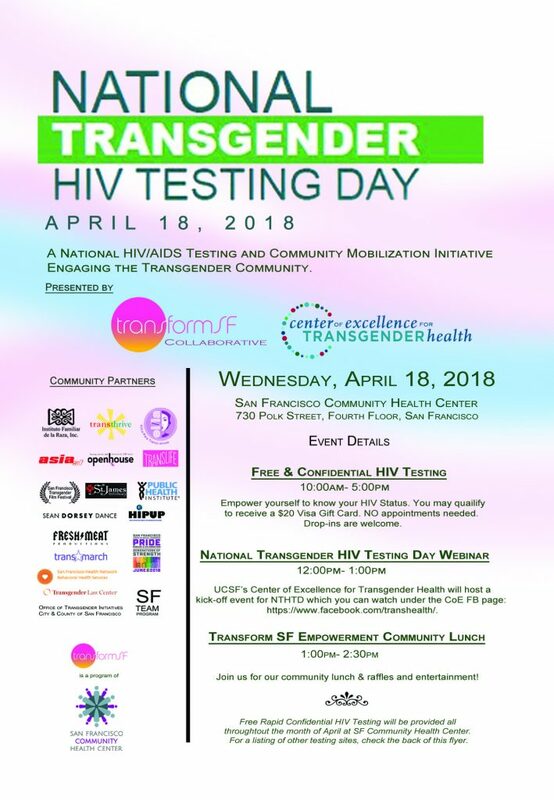 San Francisco Community Health Center (formerly API Wellness), a longtime leader in the HIV/AIDS care and treatment, is increasing the awareness of HIV testing in the transgender community, this daylong event is filled with many ways for the community to get involved. Included in the program is webinar to that highlights the transgender health needs, as well as a and empowering community lunch that will offer a raffle and entertainment. According to the 2016 San Francisco Epidemiological report from 2006 through 2016, there were 144 transgender persons newly diagnosed with HIV in the city. 90 % percent of these diagnoses were trans female. The event will be held at 730 Polk Street, 4th Floor, San Francisco CA.